Garmin Handlebar Mount for GPS 72, GPS 76 and GPSMAP 76 series (010-10305-01) €21.00 - buy online at mysatnav.ie - Ireland's leading GPS & Sat Nav store. Garmin Handlebar Mount for GPS 72 and GPS 76. 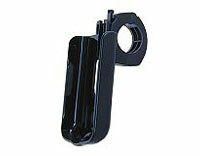 This is handlebar mount for attaching your GPS 72, GPS 76 or GPSMAP 76 series handheld GPS to your bicycle or motorcycle. The mount can fit on handlebars up to 1" in diameter.